Where is the Best Place to Start the Laminate Flooring? When installing laminate flooring, knowing where the floor is going to end may determine where you will start the installation. Lets say your starting on one side of your living room and on the other side you have ceramic tile where your going to end your flooring. Your going to want the laminate flooring to be parallel with the ceramic tile, if the laminate runs off at an angle there it can look really bad. What I do is measure from the wall I'm starting from over to the ceramic tile, first at one end and then the other. If there is a big difference I adjust my laminate on the starting wall. (move one side in or out) To make it more parallel with the tile. When installing laminate flooring I have to decide where I want it to be parallel, the wall can be way off sometimes in relation to the ceramic tile. So if that wall is going to be mostly covered with furniture, you may have to let the laminate be unparalleled at the wall where it wouldn't be as noticeable, it would be more noticeable at the tile. You may ask why don't I just start at the tile instead? You could but it can be harder to keep your floor from shifting around. 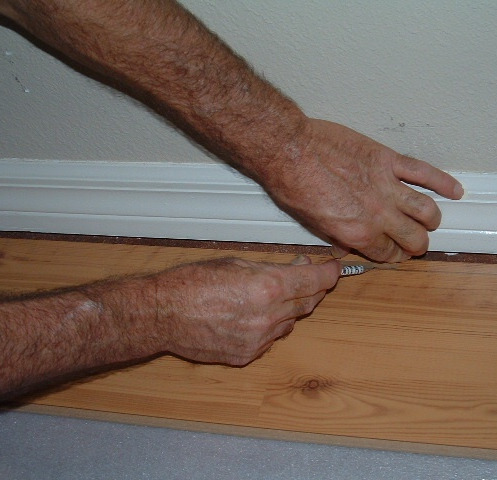 Starting on a wall allows you to use your spacers and this helps to keep the flooring from moving around as much. 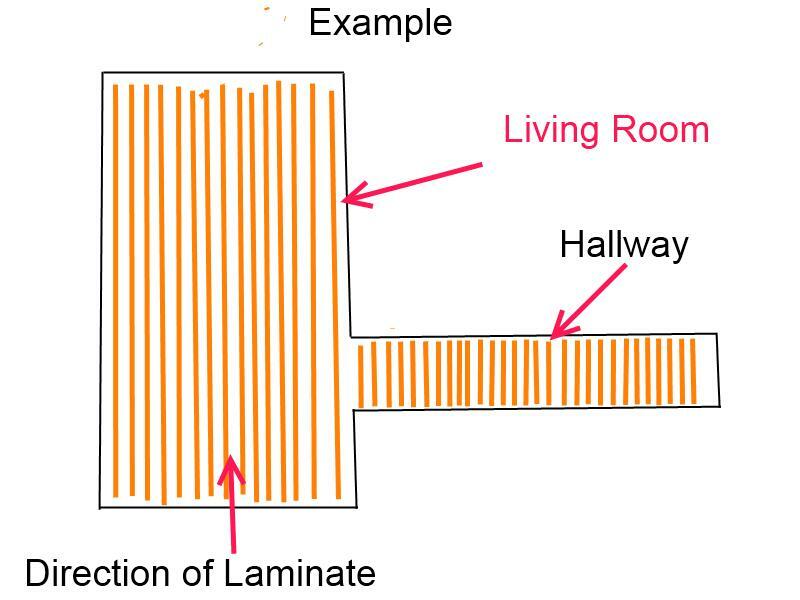 Most often when installing laminate in hallways, I would say the preferred direction is to lay the laminate the length of the hallway rather than side to side. Laying it the length of the hallway tends to make the hallway look longer. On the other hand you may want the laminate to be installed the length of a long living room, but the hallway may connect to the side of the living room and this would mean the laminate in the hallway will end up going side to side. I have heard of some installers changing the direction of the hallway where it meets the living room but I don't like the way this looks. I have never done this. There is really no right or wrong direction to install the laminate. It is what you prefer. 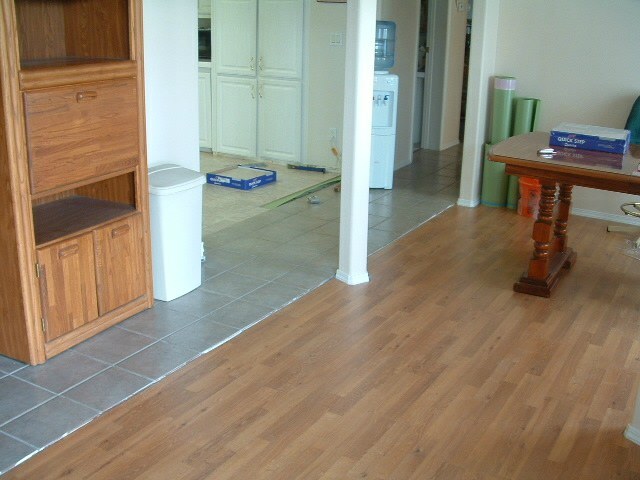 I have had clients that wanted the laminate to run side to side in their hallway. When you install the laminate lengthwise down the hallway, you want to look down the hallway and see the laminate run straight down the hall rather then angle off to one side or the other. There is a lot of talk about the way the light shining in from a window or sliding glass doors looks on laminate flooring. I see where people say that the light should shine down the length of the laminate rather than across the joints. Again I don't think there is a wrong or right way concerning this. It is a matter of your own preference. Before starting, one of the first things you need to know when installing laminate flooring is the width of the base board or 1/4 round your going to install to cover the expansion gap. Base board and 1/4 round come in various thicknesses. I will always cut a small sample to use as I'm laying the floor to make sure I don't leave too big of a gap. More often then not the wall where your starting on is not always perfectly straight. When homes are built making a straight wall isn't a high priority. The walls tend to curve in or out. 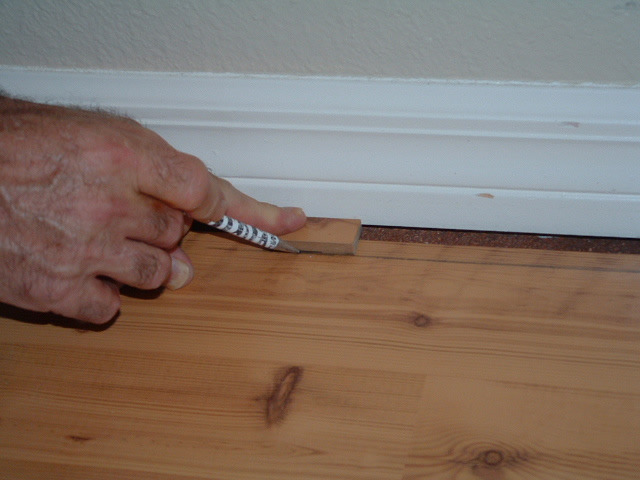 Scribing is the process of making your first row of flooring to follow the contour of the wall. Say the first row you lay is where you want it at both ends but the wall bows in 3/4 of an inch in the center. This 3/4 inch gap is too big to cover with the base board, so the gap needs to be smaller. This is where you need to scribe to know how much should be cut off. The easiest way to scribe is to use a compass. 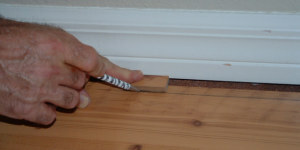 Set the compass at the width of the 3/4 inch space and follow the wall from one end to the other marking the laminate. 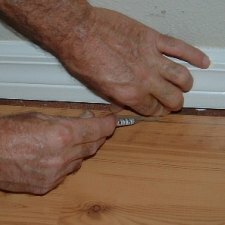 Make sure the laminate is the right distance from the wall at either end. Another simple way to scribe is to use a small piece of wood to use as a guide for a pencil. Just slide the small piece of wood along the wall with a pencil as in this photo. This will transfer the shape of the wall to the laminate flooring. Now you cut along this line so it will follow the contour of the wall. I like to use a jig saw to do this. A table saw tends to bind up if there is too much of a curve.